Better PET starts with image magnification to improve resolution, plus selective collimation to enhance true event detection. The result: crystal-clear images at 0.6 mm resolution for 18F, devoid of noise caused by random and scattered coincidences. But there is more: PET without positron-range blurring (e.g. 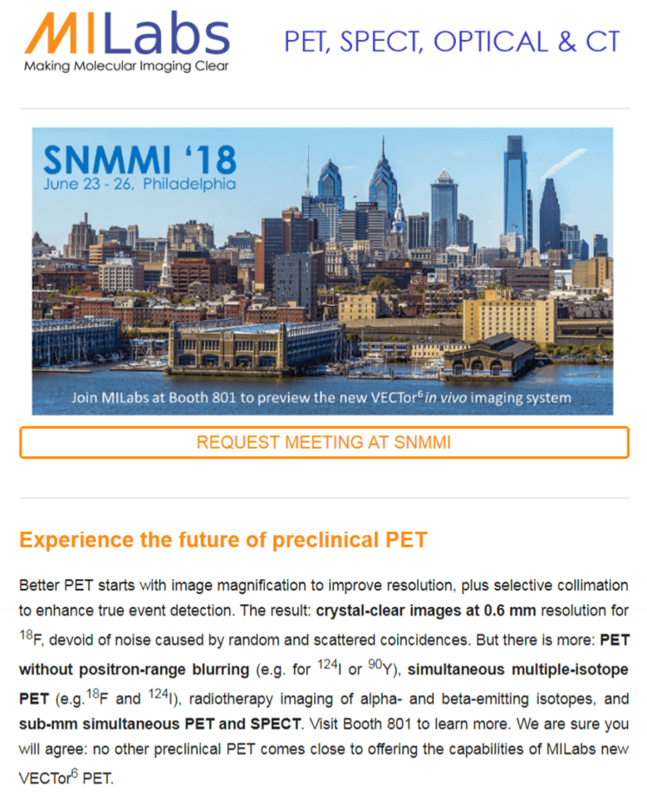 for 124I or 90Y), simultaneous multiple-isotope PET (e.g.18F and 124I), radiotherapy imaging of alpha- and beta-emitting isotopes, and sub-mm simultaneous PET and SPECT. Visit Booth 801 to learn more. We are sure you will agree: no other preclinical PET comes close to offering the capabilities of MILabs new VECTor6 PET. MILabs’ VECTor6 PET is part of its scalable 4x4D imaging platform, which includes the cutting-edge PET, SPECT, Optical Tomography & X-ray CT modalities. Prof. Albert Sinusas, from Yale School of Medicine, will give the Keynote Lecture on Cardiac Nuclear and CT imaging. Prof. Frederik Beekman, TU-Delft/MILabs, will continue his annual tradition of delivering the Scientific Highlights Lecture including the announcement of the 2018 MILabs Image of the Year. Join us Monday morning, June 25th, from 6:45 am – 8:00 am at the Convention Center in Meeting Room 106AB. Learn more here. Dynamic whole-body PET studies with just 1.4 MBq of 18F-RGD peptide labeled with the Umemoto reagent, demonstrated that excretion is predominantly by the hepatobiliary route and to a lesser extent by the kidneys.